Canadian producers are looking at a record corn for grain crop this fall. Statistics Canada's model-based principal field crop estimates forecast record production of 14.5 million tonnes of corn for grain. Canola production is estimated to be 21.0 million tonnes in 2018, while soybean production is estimated to be 7.5 million tonnes. 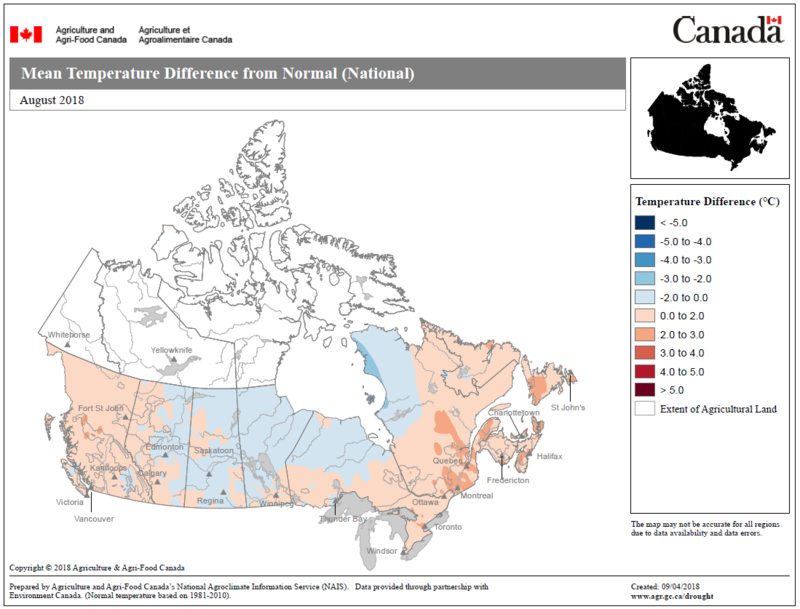 Despite dry conditions earlier in the growing season, recent weather changes, particularly in the Prairies (see map), have improved the overall conditions and the outlook on production is better than originally estimated in July. Production is estimated to increase in 2018 compared with 2017 for total wheat, spring wheat, durum wheat, barley, chick peas, corn for grain, dry beans, mixed grains, mustard seed, and sunflowers. At the same time, production is estimated to be down in 2018 compared with the previous year for canary seed, canola, dry peas, flaxseed, fall rye, lentils, oats, soybeans, and winter wheat. Total wheat production in Canada is estimated to be 31.0 million tonnes in 2018, an increase of 3.5% over 2017. An overall decline in estimated total wheat yield to 46.9 bushels per acre somewhat offset a 9.4% increase in harvested area compared with 2017. Yields are estimated to drop from last year for durum wheat (-2.0% to 34.6 bushels per acre), spring wheat (-4.8% to 49.5 bushels per acre) and winter wheat (-4.1% to 72.8 bushels per acre). Although climatic conditions were a concern in mid-summer, slightly cooler temperatures than normal in August reversed some of the downward pressure on yields (see map). Spring wheat harvested area in 2018 is anticipated to be up 8.7% compared with 2017. Production is expected to increase 4.1% in Saskatchewan to 9.1 million tonnes in 2018. Alberta production is expected to increase 5.0% to 9.2 million tonnes, while production in Manitoba is expected to decrease 1.3% to 4.2 million tonnes. Average spring wheat yields in the Prairie provinces are expected to be lower compared with 2017, with decreases estimated in Manitoba (-8.9% to 54.5 bushels per acre), Saskatchewan (-6.9% to 43.2 bushels per acre) and Alberta (-0.7% to 55.1 bushels per acre). An increase of 8.7% in harvested area at the national level is expected to offset the lower yields, resulting in an overall increase in production for spring wheat to 22.9 million tonnes, up 3.4% compared with 2017. Durum wheat production at the national level is expected to be 5.7 million tonnes in 2018, up 15.0% from 2017. Although yield is expected to be 34.6 bushels per acre, down 2.0% from the previous year, production is expected to increase, the result of a 17.3% rise in harvested area over 2017. Canola production is estimated to be 21.0 million tonnes for 2018, down 1.5% from 2017. Although the 2018 canola yield at 41.1 bushels per acre is marginally higher (+0.2%) than 2017, a 1.7% decline in harvested area will translate into a 1.5% decrease in national production. Hot, dry weather was a concern earlier this summer, however, some relief in August improved the canola yield estimates across the Prairies from earlier forecasts. Current yield estimates include 40.7 bushels per acre in Manitoba, 40.8 bushels per acre in Saskatchewan, and 42.0 bushels per acre for Alberta. At the national level, corn for grain production is estimated to be a record at 14.5 million tonnes in 2018, up 2.6% from 2017. The increase in production is the result of a similar increase in harvested area (+2.4%) from 2017, with yield for 2018 estimated at 160.1 bushels per acre. Ontario is estimated to produce a record 9.1 million tonnes of corn for grain based on a record yield estimate of 169.3 bushels per acre, up 1.4% from 2017. The previous record yield for Ontario was 169.0 bushels per acre in 2015. Quebec corn for grain production is estimated at 3.8 million tonnes in 2018. Soybean yield for 2018 is estimated at 44.1 bushels per acre (+12.8%) at the national level. Despite the increase in yield, an anticipated decline of 13.7% in harvested area to 6.3 million acres is expected to result in a production estimate of 7.5 million tonnes for 2018, down 2.6% from 2017. Ontario is estimated to produce 4.0 million tonnes of Canada's soybeans, or 53.3% of the national production in 2018. Manitoba is second at 1.9 million tonnes, or 25.3% of the country's capacity. That is a substantial increase from the 36,700 tonnes produced in 2001, when Statistics Canada first reported soybean production in Manitoba. Model-based principal field crop estimates are calculated according to an approach developed by Statistics Canada in close partnership with Agriculture and Agri-Food Canada. These yield estimates are based on a model that incorporates coarse resolution satellite data from Statistics Canada's Crop Condition Assessment Program, data from Statistics Canada's field crop reporting series, and agroclimatic data. A methodology report describing the yield model used at Statistics Canada is available online. Production estimates for Quebec, Ontario, Manitoba, Saskatchewan and Alberta are calculated using the model-based yields as of August 31, multiplied by the reported harvested area from the July Farm Survey of the field crop reporting series. Estimates for Prince Edward Island, Nova Scotia, New Brunswick, and British Columbia are carried forward from the July estimates of production of principal field crops. Final crop production estimates for the current year will be released on December 6, 2018.